How about having a Minimoog on the iPhone, iPad or iPod Touch, released by Moog itself, paying less than 5 dollars? 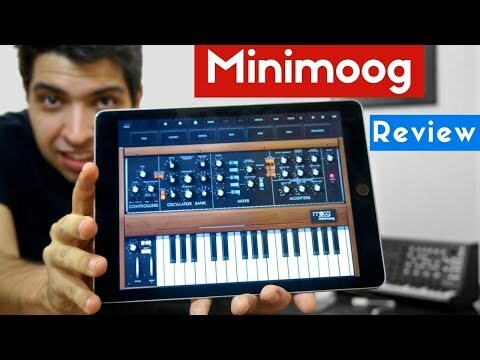 That's right, Moog Music has released the Minimoog Model D for iOS! Minimoog is an absolute classic. dream of almost all keyboard players. Moog's monophonic analog synth has been out of production for a long time. In recent years, it has been re-manufactured in a limited edition, but is already out of production again. entirely based on the original instrument, compatible with iPad, iPhone and iPod Touch with 64-bit processor. The interface is what we expect from a Minimoog. We have 3 oscillators, the classic low pass filter, the envelope generators, etc. But the cool look becomes an accessory when we start to hear the sounds of the Minimoog Model D app. Moog seems to be using the same sound engine inside the Minimoog. The tone is very bright, the bass is present and the controls are smooth and very precise. And there are 160 presets of different categories, including the classic group, with some sounds you'll probably recognize. But the Minimoog Model D app is not limited to re-creating the behavior and sounds of the original instrument. It takes advantage of digital technology to bring some cool news. The Minimoog app, unlike the analog synth, is capable of operating also in polyphonic mode with 4 voices. of chorus, capable of other modulations too), a stereo ping pong delay and a looper, to create sequences and improvise. used in GarageBand and other music production apps on the iPad or iPhone. The Ableton Link feature is also available. It works with any MIDI controller that works with iOS and you can easily map all the panel controls with the MIDI Learn. By the way, the app is capable of operating also with high-resolution MIDI controls, which is great! allowing the control of pitch and pitch bend independently by note. You can also switch presets via Program Change messages and use Bluetooth MIDI controllers. with extreme ease, via airdrop, dropbox, email and etc. a minimoog simulator for iPad that has been around for some time. If your a curious about that, check this video to watch my comparison showing the main differences between them. Finally, just two criticisms: I found the system of presets a bit weird. It is beautiful, but not very functional working just horizontally. The other thing has to do exactly with the use of the screen. I would love to be able to hide the keyboard when using a MIDI controller. It is not always necessary to occupy the space with the virtual keys. The same goes for this part of settings and options. I always remember Korg's iMS-20, which I consider to be one of the best synth interfaces ever released for the iPad. paying less than 5 dollars, with a version created by the manufacturer of the original instrument. instrument that costs almost a thousand times its price! The cool thing is that the app sounds great, behaves like expected and is extremely useful and fun! This was the review of the Minimoog Model D app for iOS. If you like it, please give it your thumbs up and subscribe to the channel.